There were several new tactical scopes on display at SHOT Show 2016, with three standout companies behind them. 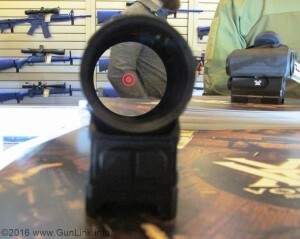 For precision shooters, Vortex was showing off their Razor HD AMG scopes. The Razor is a US-made first focal plane (FFP) scope that features apochromatic objective lenses, so the colors you see through the scope will remain true and the glass-etched reticle – available in MOA or MRAD versions- will remain in proportion to the target across the entire, substantial 6-24x zoom range. The constant reticle proportions and large, easy-to-use adjustment turrets will make this scope easy to use across a range of changing shooting conditions. All this comes with a price tag of around $3400.